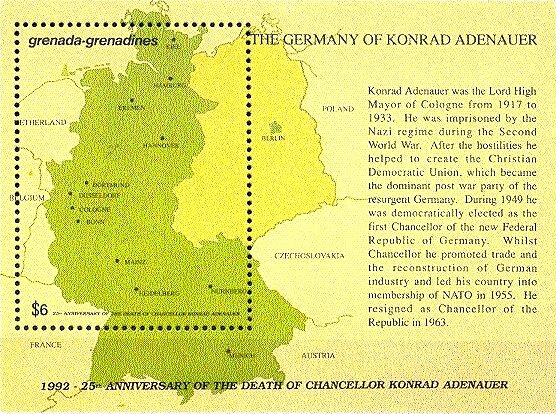 Mark Honig has pointed out a number of errors on this souvenir sheet issued by Greneda Grenadines in 1992. On the map Luxembourg is the triangular shape just above the $6. The name is missing (all the other countries are named); the shape is wrong and it is larger than it should be; the northern tip of Luxembourg almost touches The Netherlands. The borders between The Netherlands and Belgium, The Netherlands and Germany, and Luxembourg and Belgium and Germany are incorrect. The coastline of The Netherlands is incorrect, and the islands off the coast of The Netherlands are missing. And finally, "Netherland" should have an "s" at the end! Thanks to Mark Honig for the scan of this souvenir sheet.